When you've got a birthday party formula that works, stick to it. That's what we've been doing for our childrens' parties over the years and we've got Waggle Dance - Kids Parties & Events to thank for it. Waggle Dance is a one-stop-shop for kids' party entertainment. Choose from an exciting selection of themes to suit your child's tastes and your parenting budget. Themes include Tropical aka Moana and Mermaid Parties, African Drumming and Capoeira. 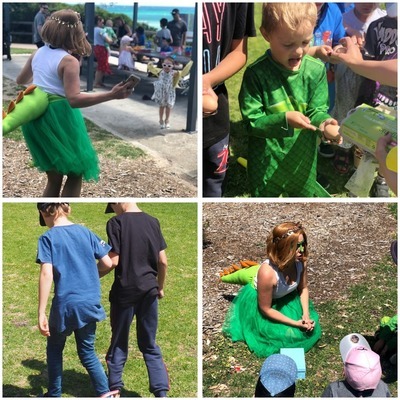 The majority of our children's birthday parties are held in the park, with a few exceptions when the weather changed at the last minute. This year we did the same, choosing the Delightful Dinosaur Party entertainment with Waggle Dance. Family and family members were invited to join us at Victory Park in Chelsea. Side note: the beautiful blue hues of Port Phillip Bay are a stunning backdrop if you choose the same location. We booked our Waggle Dance party host ahead of time, and patiently waited through many weeks of "is it my birthday party yet?" questions until we reached the big day. 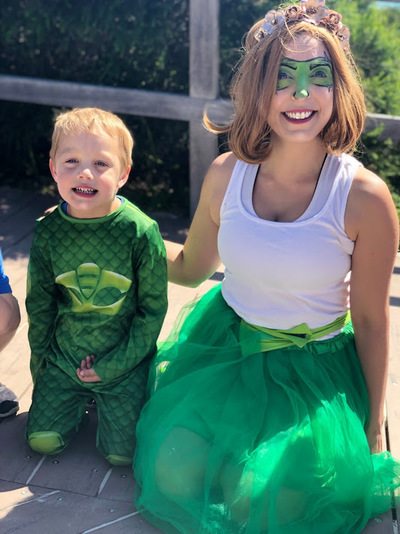 We've broken down the party for you, so you can see why hiring a party host with Waggle Dance is the best idea for a kids party in the park.. or anywhere else for that matter. From the beginning, your party is taken care of. Sometimes the smallest things take the longest time, invitations for one. Waggle Dance arrange your invitations for you, personalised to your child's party. All you have to do is send off your invitations via SMS or email and you're all set. Waggle Dance party hosts are a cut above the rest. 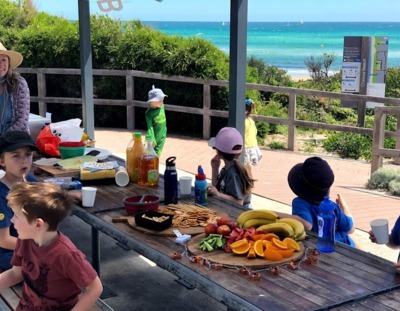 Some of the best Melbourne party hosts in the business have been hand-picked by the Waggle Dance team, ready to entertain your child's party crew and on your terms. A mermaid party at the beach? Done. Unicorn party in your backyard? Sorted. Silent disco party in the hall? No problem. Parties in the park are excellent. Outdoors. No venue hire fees. Neutral ground for everyone. Without a hired host however, it can be difficult to gather all the kids in one spot and there's always the stressful part of trying to find "missing" children who've found a hidden spot somewhere in the playground. A hired host, particularly one via Waggle Dance, entertain the party crew for the entire time with all children assembled in one spot. Waggle Dance party hosts know how to entertain children of all ages. At the start of our son's Delightful Dinosaur Party, the tweens floated around the peripheral. 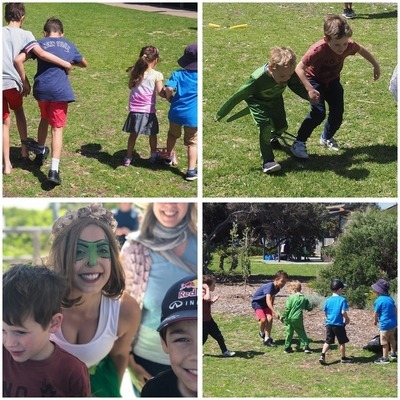 Soon though, the too-cool-for-school kids were part of the action; three-legged racing, egg-and-spoon scrambling and disco dino'ing with the little ones. Booking a host via Waggle Dance means all you need to worry about is the cake, food and decor (the latter being as simple or extragavant as you wish). Everything else is taken care of. This means you can sit back, enjoy your child's party and possibly even have time to catch up with a fellow parent you haven’t seen for some time while the kids are having fun. Once again, our Waggle Dance party entertainment exceeded all expectations. No kids felt left out. There were no tears and definitely no bored children. Every single child, from the ages of 3 - 11yrs, had a fabulous time. The party host kept every single child entertained for the hour. That is by no means an easy feat. Head to Waggle Dance - Kids Parties & Events to book your child's next party host. You won't be disappointed.